I don't want this to be a long story, but it started a few weeks back when Til brought me home some tinned and some dried. So in anticipation of tonight's extravaganza, I went to the Tokyo Fish Market to stock up on accoom, acompt, the feller that plays the guitar. Accompanists. 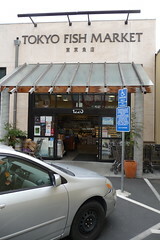 It's pretty boutique: huge fishmarket, great sushi guy, small produce area, and a lot of Japanese products that I can only begin to figure out. 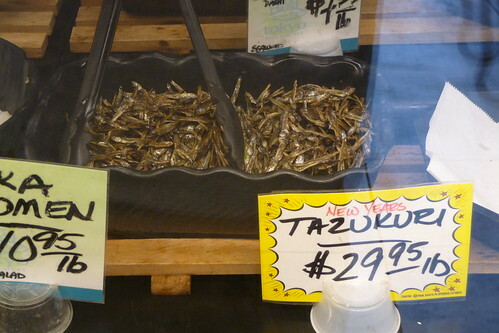 They had tinned sardines, powdered sardines, dried sardines. And Tazukuri. I asked the Man what they were, they looked good and so he offered me a taste. 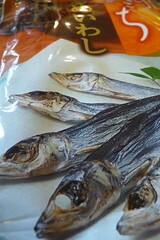 So much better than the dried sardine, salty and chewy with a soy based BBQ sauce. I should have, I mean will, get some more of these. 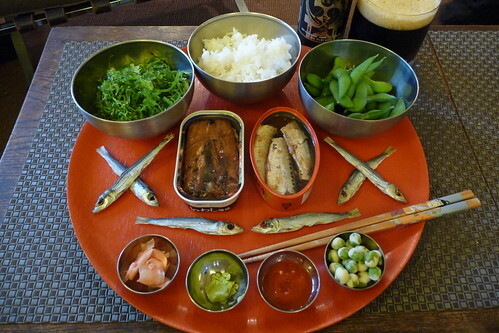 So, I get home, plate up rice, sea salad, edemame, wasabi, ginger, Sriracha, roasted green peas, the Natori dried sardines, and two tins of sardines and wait for GG to get home. One is the Mahura Nichiro tin that Til brought back from Japan. And a Nishimoto Trading Company, LTD product, I picked up at TFM. 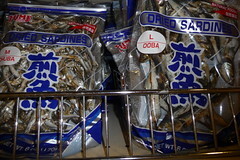 Those Dried Salty Chewy Sardines, came six to the package, and while the belly bites and the head bite, for me were OK, GG thought they were nasty and scrambled for her Ozeki Karatamba. 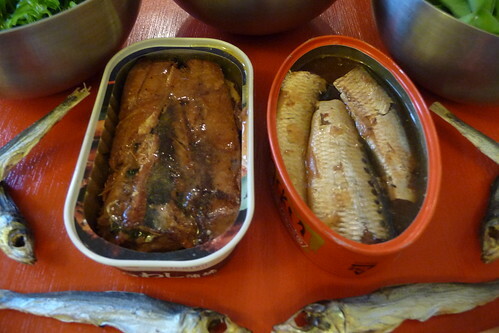 The tin on the right is the Nishimoto, they're in soy sauce, three big lightly smoked fish with a bone, mildly briny, and kind of falling apart - but tasty. 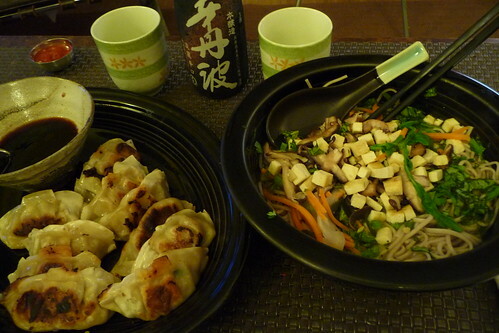 My first soy adventure and I like it. Four out of Five Tins. 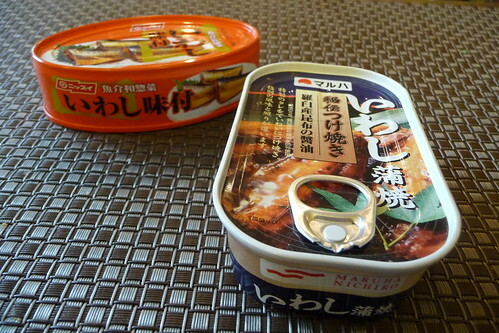 The tin on the left is the Mahura Nichiro, brought back from Japan. Four nice smoked fish in a killer BBQ sauce. Reminds me of Unagi, firm, sweet, I want more. FIVE TINS. 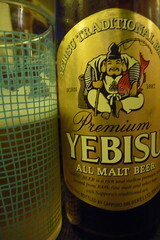 Echigo Stout. Imperial Stout, straight outta Nigata. Its alright. Not really, but we drink the Ozeki Karatamba all the time. Chased it all with more Amazing Food. See if you can find a little blue bottle of beer called Ginga Kogen; Incredible Japanese micro-brewed hef. Bossman is returning from 5 weeks eating his way around southeast Asia, and has promised me at least one tin. Keep your fingers crossed for me.